Good catch if you think this fabric looks familiar. 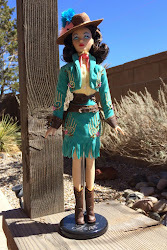 Sherril made a blouse out of the same fabric, which she's wearing on her PR avatar! The Tango skirt pattern allows the fabric to be the star, and each one looks different enough that non-sewing friends don't roll their eyes when they see yet another one made up and worn. There will be more, because it's so easy to make, and pretty to wear. Update 3/16/09: I wore this outfit to work today with a black knit top, also from Talbot's. Everything was comfortable and simple to wear while looking good. I'm sure the skirt will be a workhorse in my wardrobe! Thanks for all your compliments. 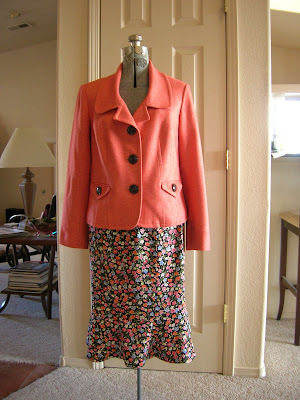 Your new Tango skirt looks really great with that jacket! Nice outfit. I bet you look great in it. I have a pattern of hers, but don't remember which one. I am going to read the S magazines right now. I thought orange was the best color with this fabric too. I bet it works great as a skirt. Very cute, it looks great with the jacket. You may have a few look-a-likes inspired out here in blogland if this is as easy as you say! Great outfit. The skirt would be pretty with a summer "T" also. Very nice. Great looking skirt. Goes great with your jacket! I really like the combination! Wonderful outfit! Ditto what everyone else said. Perfection! Very cute skirt! Love it with the jacket. I love that combination. I think I finally have to find my tango skirt pattern and make it.